Billy the Kid Produce, LLC in Deming, NM has entered an agreement with L&M to be their exclusive onion marketer. Both Billy the Kid and L&M are family-owned businesses with strong values and a shared focus on excellent quality and customer service. “We are honored to be working together with Billy and the Franzoy family to service our customers and help them grow their businesses. Over the years, the Franzoys have made impressive investments in their operation. The scale and progressive nature of their culture made it a natural fit for L&M,” said John Oxford, President & CEO of L&M. Billy the Kid operates a state-of-the-art facility within 20 miles of all of their onion fields. The packing facility boasts over 100,000 square feet with photo optic sizers and robotic palletizers that ensure maximum efficiency and consistency in sizing, sorting, and stacking. Billy the Kid will grow approximately 700 acres of onions this season, beginning harvest in late May and continuing through mid-August. “Our new partnership with Billy the Kid fits very well with L&M’s onion program. Our California crop wraps up at the end of May and we begin harvest on our Kansas crop in mid-August. This partnership will allow for a seamless transition and an uninterrupted supply of quality onions for our customers,” said Derek Ennis, L&M’s Potato & Onion Sales Manager. “We’re excited to be working with L&M and look forward to a long future together,” said Billy Franzoy, Billy the Kid’s founder and a grower for the partnership. “For the past 30 years I have represented my family to the onion industry. My decision to step out of onion sales was driven by the fact that I need to spend more time focused on the growth of the Hatch Chile Factory,” said Chris Franzoy, President & CEO, Young Guns. “The decision to hand over the onion marketing reins to L&M was an easy one to make. They have a great track record and are leaders in the industry. I’m very excited for both L&M and Billy the Kid, and I know for a fact there is no better company to represent my family,” he continued. Formed by Billy Franzoy, Billy the Kid Produce has been growing onions since the 1970’s. Today – along with his 4 sons – this 4th generation farming family has become a preeminent onion grower in New Mexico. It’s often observed you can haul onions on practically anything and driver Pelvis Bates of Newberry, SC is proof. HaulProduce.com met Pelvis several weeks ago as he was unstrapping a flatbed trailer with a load of onions. He had delivered a load of steel from North Carolina to San Antonio. From there he deadheaded to south Texas where he picked up the onions around 10 p.m. on a Tuesday and was preparing to have them unloaded on the Atlanta State Farmers Market on the following Thursday afternoon. His onion load was grossing 71,000 pounds, with the product on pallets on a 48-foot Great Dane flatbed. He was driving an International Pro Star Premium. Pelvis drives for Senn Freight Lines Inc. of Augusta, GA, a company he says is owned by two brothers running 102 trucks. This was the 45-year-old trucker’s first produce load in his relatively short career in trucking. “They (shipper) told me to leave the front and back of the load open (with the rest of the load covered by strap held tarps) so the air could flow through it. This was to help prevent the onions from going bad,” he said. Before entering trucking three years ago, Pelvis worked for a screen printing company. When that business folded, he received a severance pay and used some of the money to enroll in truck driving school. His first job in trucking was with Swift Transportation pulling dry vans. He has been with Senn Freight about a year. As Pelvis was unstrapping his load after the 1,300-mile haul, he says this is the first job he has had pulling a flatbed trailer. “It is extra work unstringing the straps and and removing the tarps. When I first started doing this it took me two hours to strap a load. It now takes me about 45 minutes to an hour. That’s a lot of strapping. These tarps weigh 180 pounds each. If it’s 100 degress out here, that is hard work,” states the 45-year-old. Potatoes and onions, c ommonly known as “hardware items” because they are less perishable and generally pose fewer problems when hauling, also normally do not pay as good a freight as most more perishable items. However, the further into fall and the closer to winter, overall fresh fruit and vegetable volume declines, and so do freight rates — and loading opportunties. Therefore, if nothing more than out of necessity potatoes and onions begin looking more attractive if you want or need to haul produce. In the Snake River area of Oregon there is good demand heading into winter for trucks. An early start of the shipping season combined with fewer onions means less product is left for shipping than normal. Truck loads could be down 15-20% for Treasure Valley growers, due to the fourth-hottest summer on record and other weather-related issues. Fewer onions mean shippers are having less difficulty finding enough trucks to move product. Around the border area of Western Idaho and Malheur County, OR, nearly 700 truckloads of storage onions are being shipped weekly. Similar volume with onion shipments are available from the border area of the Columbia Basin in Washington and the Umatilla Basin of Oregon. In Northwest Washington, just north of Seattle is light volume with red and white potatoes from the Skagit Valley. The nation’s largest volume potato shipper has another huge crop this year. The state is averaging around 1500 truck load equivalents per week, although a significant amount of these potatoes are loaded in rail cars. Storage onions are being shipped from Colorado’s Western Slope, near Olathe, and will continue well into January. Excellent quality is reported. Loads have been moving out of the area at a brisk pace in part because of Colorado’s freight advantage over western shippers….In south-central Colorado is the San Luis Valley, which is shipping around 750 truck loads of spuds per week. Colorado potatoes – grossing about $1800 to Dallas. Idaho potatoes – about $5500 to New York City. Columbia Basin/Umatilla Basin (Washington and Oregon) potatoes and onions – about $4200 to Chicago. Produce shipments from the Western half of the USA offer perishable haulers some obvious and not-so-obvious choices for obtaining loads. Here’s some places you may not have considered. New crops of potatoes are now available in some upper mid-western states. The Big Lake, MN area is shipping both red potatoes and russets. New crops of spuds have recently got underway from Central Wisconsin, Nebraska and Northern Colorado. In Idaho and Malheur County, OR., loading opportunities have recently become available with a new crop of storage onions. While the area is known for its onions, a few shippers are starting to offer sweet onions. Just be aware that these shippers are new at this game and still may be on a learning curve relating to quality. Sweet onions often do not store well. In California, the heaviest volume from the Salinas Valley is with head lettuce, averaging about 1,100 truck load equivalents per week. Many other vegetable items are also being shipped…..In the nearby Watsonville District, about 750 truckload equivalents of strawberriers are being loaded weekly. Plenty of loading opportunities are coming from the San Joaquin Valley of California with stone fruit, veggies and grapes. Heaviest table grape movement is from the southern valley area known as the Kern District, but volume is rapidly increasing from more northern areas of the valley. An update on apple shipments from Washington state, shows it will account for 77 percent of the nation’as apple shipments during the 2012-13 shipping season. Washington always leads the nation in this category, but with heavy weather related losses to apples in Michigan and New York state, the northwest will provide an even more than normal percentage of the country’s apple loads. Washington expects to ship its second largest amount of apples in history; and this is despite a 10 to 15 percent crop loss due to hail storms earlier this year. Salinas Valley produce – grossing about $7500 to New York City. Big Lake MN potatoes – about $1300 to Chicago. Central Wisconsin potatoes – about $2500 to Atlanta. Most fruit and vegetable rates are paying significantly more than rates on potatoes and onions right now, but the difference in rates will be shrinking in the next several weeks as overall fruit and veggie volume seasonally declines and the spud and onion volume rises with the new crops. There is over 1 million acres of potatoes planted in the USA for the crop that is now being harvested. That is 46,000 more acres than at this time a year ago! Translation: There’s a huge crop that will need to be transported to market – and the railroads can only haul a relatively small amount of it. That means plenty of hauling opportunties this fall, winter and next spring for truckers with refrigerated equipment. The top nine states with the most potatoes in order of size are: Idaho, Washington, North Dakota, Wisconsin, Maine, Colorado, Minnesota, Michigan and Oregon. Idaho, the USA’s biggest potato producer, will have a lot more potatoes for hauling this season. Potato shipments from Washington and Oregon get underway in early August, with volume expected to be normal and about the same as a year ago. Washington has about 25,000 acres of spuds for the fresh market. The Umatilla-Hermiston potato volume may be down a little from last season. No big deal though. In central Wisconsin, red, white, yellow and russet potato diggings have been underway and shipments begin when the old crop is all sold, or customers begin demanding fresh potatoes from the new season, over the old ones which have been in storages forever. The spuds becoming available will be more abundant than on average from the past five years. Helping Western onion shipments was the early demise of the Vidalia, GA onion season. It has created bigger demand for onions in the West and demand for trucks from places such as Bakersfield, CA and from Southern New Mexico and the Pasco area of Washington state. Also, imported onions from Peru will begin arriving at USA ports in early August. 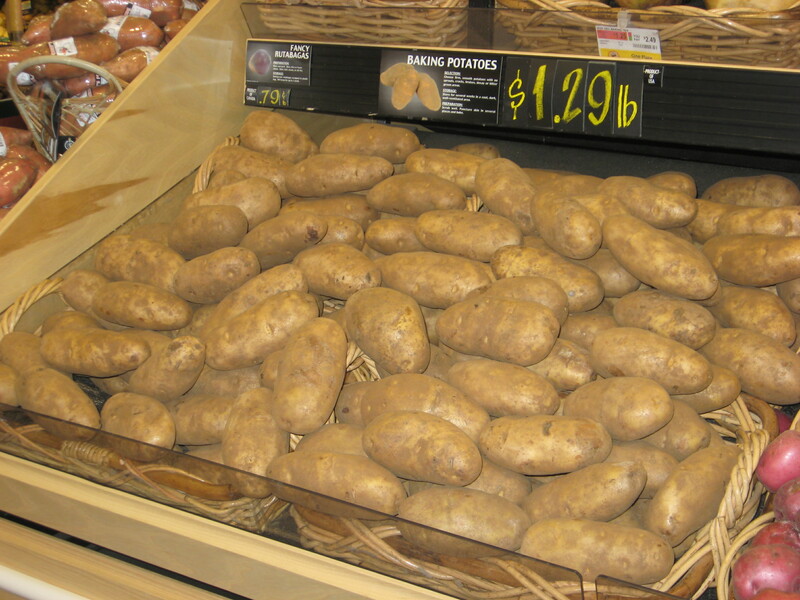 Idaho potatoes are grossing – about $4800 to New York City’s Hunts Point. Here’s some items that are now available in your local supermarket, or will be available soon. Starkrimson pears are among the first to be harvested early in the season and have a crimson red color that brightens as its ripens. They have a juicy texture and sweet flavor. Starkrimson pears are recognizable by their unique color and thick, stocky stem with a neck that appears to be growing up and around it. Bosc pears are large with an elongated neck and have a distinct bronze/yellow color. Bartlett is among the top pears in the U.S. Bartlett pears are bell-shaped with a classic sweet pear flavor and smooth, buttery texture. Bartlett pears are excellent for fresh eating and are a common pear used for canning. Bartlett pears are the most popular of the pear varieties. They are picked at full mataurity in August and will ripen from green to yellow by the time they reach your supermarket shelves. The Bartlett is a classic pear for canning and is great for fresh eating, pies and sauce. Sweet onions from the Vidalia, GA area are pretty much history because of a smaller crop and the season ending earlier than normal. While it may be the most famous of the sweet onions, a number of other states have established themselves in the past decade or so as providing consumers with some pretty tasty sweet onions themselves. South Texas also grows a good sweet onions, but it has ended like Vidalia. California is now providing sweet onions and will do so into August. One alleged “sweet onion” I would avoid are those from Colorado. Every year the Rocky Mountain state has bags of onions in my local supermarket labeled “sweet” and they never fail to disappoint, much less set my mouth on fire. One of the best sweet onions coming on before long I’ve been pleased with from year to year is from the Skagit Valley in Washington state. One of the better imported sweet onions that should be in your stores by early August are from Peru. Sometimes, they are lacking a little sweetness at the start of the season, but get better as we move closer to fall. You should also be seeing some good reasonable retail prices on table grapes from California, especially with the red grapes right now. Soon to follow will be the yellow seedless grapes. With a good chance for a record crop from California, there should be some good prices on grapes this summer. Another good buy in the coming weeks and months should be on potatoes with the new crop set to start. The USA has over one million acres of spuds planted, which is 46,000 more acres than at this time last year.